Villa Canonniers 1 is a 3-star villa which offers the ideal accommodation for couples of families alike. 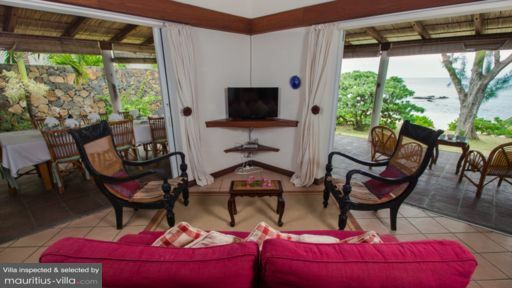 Located at Pointe aux Cannoniers, in the Northern part of Mauritius, this villa offers three air conditioned bedrooms to accommodate your guests. Boasting splendid views of the Mauritian lagoon, the villa even overlooks Coin de Mire a tiny islet found just beyond the coral reef. As a guest of the villa, you will be able to enjoy different amenities such as access to a private beach, private garden and the likes. At Villa Canonniers 1, you can benefit from the cozy comfort of a master bedroom which overlooks the ocean. With a double bed, this room has two bedside tables and lamps, a writing desk and chair as well as a closet and a safe to keep your money and valuables. The master bedroom is air conditioned and has its own en-suite bathroom with shower, double sink with mirror and a toilet. Storage spaces are included in the bathroom for your toiletries. Villa Canonniers 1 is equipped with two guest bedrooms, one with a double bed and one with two twin beds. These two guest bedrooms share a bathroom between them, complete with shower, toilet, sink and mirror. All the amenities such as towels and toiletries are included in the bathroom. Bedsheets and linens are included in guest and master bedrooms alike. While it does not have a pool, Villa Canonniers 1 boasts a massive garden filled with abundant foliage and lush greenery that will bring some much-needed shade on hot days. Guests can benefit from sun loungers that have been placed around the garden where you can lie back and enjoy the deliciously cool sea breeze as you work on your tan. The front yard opens on your own private stretch of beach where you can enjoy a dip in the azure ocean anytime of the day- or night. The terrace has been fitted with outdoors dining furniture which is ideal for guests who want to dine alfresco as they savour balmy evenings serenaded by the gentle crashing of waves against the sandy shore. The well-manicured lawn is certainly a sight for sore eyes as it positively radiates calm and tranquility. 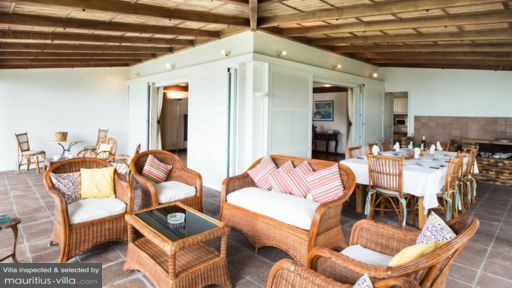 At Villa Canonnniers 1, you can benefit from both an indoors and outdoors living area. Indeed, a covered open-plan terrace houses a dining table which can seat eight people. The indoor dining room table also contains eight chairs while the indoors living room is equipped with a television, coffee table and rattan sofas. Because the villa is self-catering, guests can also enjoy the amenities such as a microwave, gas stove oven, cupboards, coffee maker, kettle, sink, toaster over as well as different types of utensils that will serve you well as you prepare your meals. In the kitchen, you will also find a charming old-school table with two long benches where you can enjoy informal meals with friends and family. Guests at Villa Canonniers 1 scan benefit from the services of a housekeeper who will take care of the ironing, cleaning, laundry and the likes. A private parking is also offered. As a guest of the villa, you can also benefit from a private access to the beach as well as barbecue facilities in the garden. Internet access is offered as well as a flat-screen television with satellite channels. 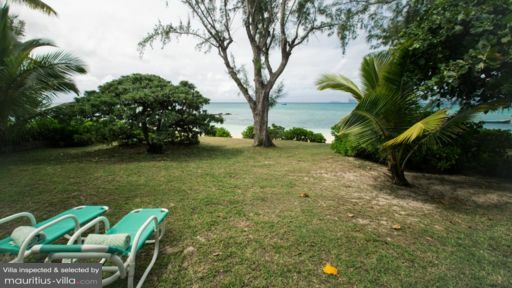 Villa Canonniers 1 is only twenty minutes from Mauritius’ capital of Port Louisand five minutes from the tourist village of Grand Bay. From the villa, you can enjoy stunning views of the islets around Mauritius such as Round Island, Flat Island and Coin de Mire. If you want to explore the glorious underwater wildlife, head over to the nearby Hotel 20 Degrees Sud where you can benefit from diving lessons from an accredited diver. After the first few lessons in the hotel’s swimming pool and the lagoon, you will be ready to take the plunge in deeper waters where you will be enthralled by the magnificent shoals of fish and corals.